A report by CNN Madrid. Ines Madrigal pictured as a child. She believes she was stolen from her birth mother. Madrid (CNN) It was almost half a century ago that Ines Madrigal was born in Spain and handed to a woman who was not her mother. In all those years, she has seen no trace of her birth mother, nor any evidence that she was willingly given up for adoption. Madrigal suspects she was one of Spain's ninos robados -- stolen babies -- a victim of a sinister political practice that began after the Spanish Civil War and continued as recently as the 1990s. Eduardo Vela, an 85-year-old obstetrician, faces court in the Spanish capital of Madrid on Tuesday, accused of abducting Madrigal as a newborn back in 1969. Public prosecutors are seeking an 11-year jail term for the illegal detention of a minor and forging a public document. 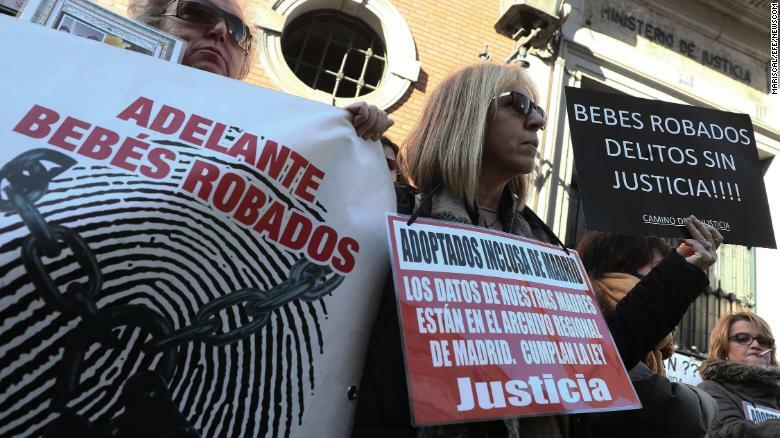 Several people take part in a rally to demand justice in the cases of Spain's stolen babies on January 27 in Madrid. The woman who adopted Madrigal -- Ines Perez, who died two years ago -- had told CNN in 2012 that Vela gifted her the baby. Vela admits the signature on Madrigal's birth certificate is his, but he denies any involvement in "stealing" Madrigal, and is seeking a full acquittal, court documents show. Evidence is growing that babies were removed, at first during the Franco era from families seen as Republicans and given to others loyal to the fascist regime. Some are believed to have been sold. The issue only came to light in 2011, when friends Juan Luis Moreno and Antonio Barroso publicly shared their stories, saying their fathers had bought them as children from a priest in the Spanish city of Zaragoza. Madrigal has brought Vela to court, and hopes that her case shines a light on the many others that have gone ignored. "I am not expecting that Eduardo Vela will tell me who my mother is, I know that is almost impossible," Madrigal told CNN. "But I do hope for a favorable sentence that can open the door to do something about the statute of limitations, which is blocking many complaints." Many of the allegations related to the stolen babies have failed to reach the courts as some of the alleged crimes have passed the statute of limitations. At least 2,000 official cases of stolen children have been filed with Spanish prosecutors, but some victims' groups believe there could be tens of thousands more. Madrigal was taken in by Perez in 1969. 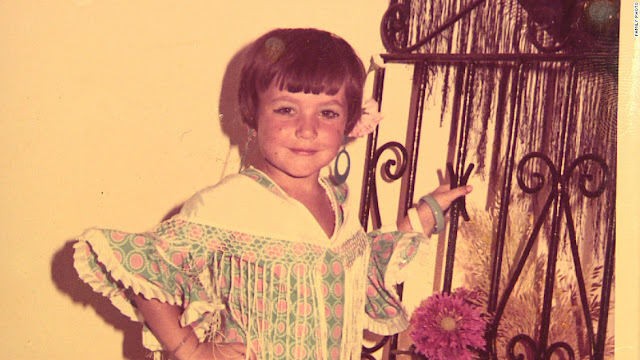 Perez told her daughter of her origins when she turned 18, and always supported her in her mission to find her birth mother. She died two years ago at the age of 93. "It's a shame that my mother is not alive to see this moment," Madrigal said of Perez. When she was alive, Perez told CNN in 2012 that Madrigal was given to her as a gift from Vela for having looked after a boy, and denied ever paying for Madrigal. "They didn't give me flowers or money. They gave me a baby girl," she said. On the day Ms adrigal was born, Vela called Perez to the maternity clinic where he worked for a "surprise," she had said. When she arrived, he placed a newborn baby in her arms and handed her a falsified birth certificate, Perez claimed. The baby was small, born premature, she said. 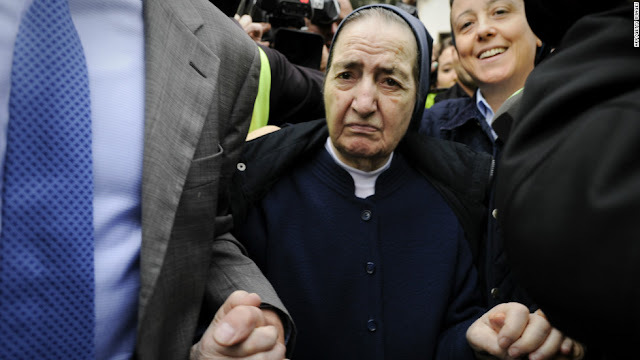 The late Sister Maria Gomez at a Madrid court hearing. Vela has for years denied any wrongdoing in Madrigal's case. He has claimed in the past that he only helped women who wanted to put their children up for adoption and never pressured any mother to do so. Vela is not the only person who has been named in connection with Spain's stolen babies. A nun, Sister Maria Gomez, appeared in a Spanish court in 2012, accused of snatching an infant from her birth mother and putting the child up for an illegal adoption in 1982. She appeared in court as a suspect but died just days before her trial officially opened. One day after her appearance in court, Gomez issued a statement denying the allegations saying they were deeply disgusting and that she had never known a single case of a newborn being taken from a mother through coercion or threats. She had flatly refused to testify and was jeered as she stepped outside the court.